Facing enrollment decline and budget cuts, the Raytown School District is eliminating 20 Title 1A Instructional Assistants for the 2019-2020 school year. KANSAS CITY, Mo. 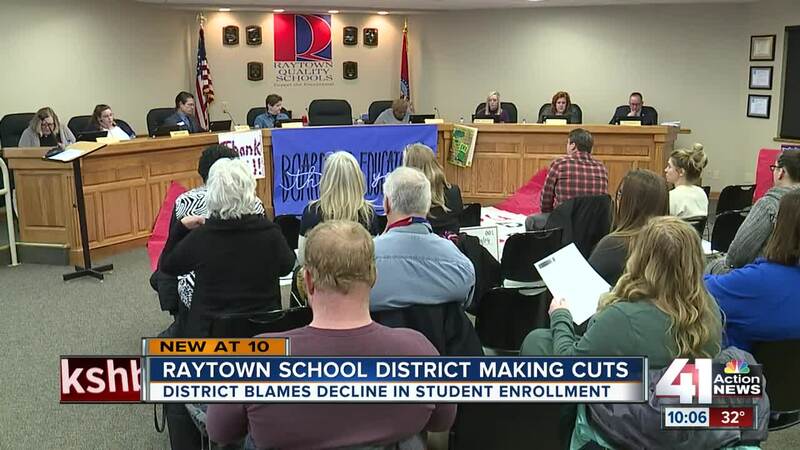 — Facing enrollment decline and budget cuts, the Raytown School District is eliminating 20 Title 1A Instructional Assistants for the 2019-2020 school year. According to the district, student enrollment has decreased by more than 500 students. Consequently, the district is expected to lose more than $1.7 million in state revenue for the 2019-2020 school year. "This loss in funding comes in addition to a loss of over $700,000 in state public placement funds over the same three-year period. A decline in revenue is at the core of the District’s decision to cut the Title I Instructional Assistant position for the 2019-2020 school year as the District is faced with the need to “right-size” staff to match student enrollment," said a statement provided by the district. The enrollment decline has effected every school and grade. According to the district, the senior class is the largest and the kindergarten class in the smallest. The district also struggles with a transient rate of 22 percent -- students entering or leaving the district in a given year. "Over the past three years, the Raytown C-2 School District has seen a decline in enrollment by over 500 students. The decrease in student enrollment will lead to an anticipated loss of over $1.7 million in state revenue for the 2019-2020 school year. This loss in funding comes in addition to a loss of over $700,000 in state public placement funds over the same three-year period. A decline in revenue is at the core of the District’s decision to cut the Title I Instructional Assistant position for the 2019-2020 school year as the District is faced with the need to “right-size” staff to match student enrollment. Last year, the District began making cuts to certified staff including teachers, coordinators, and administrators, and support staff including technology and operations employees. Cutting Title I Instructional Assistants and redesigning the reading program at elementary schools will allow the District to reallocate Title I funds, moving some supports to secondary schools to meet the critical needs of students. It is the desire of the District to support employees affected by the change throughout the process and retain as many staff members as possible. Therefore, early notification is a key part in allowing both parties the time to find placement in other positions in the District as they become available. The work of the District and its employees will continue to focus on the collective responsibility to provide an exceptional educational experience to all students."